Following my successful tour last week to Windsor Castle, I was delighted to be asked to take my two lovely guests from Australia to Portsmouth Historic Dockyards. It’s not always an obvious choice at least for overseas visitors staying in London but it’s always a very busy place with visitors from all over the country and the world. My initial efforts to start the day early floundered when it took me 45 minutes to drive just a mile (welcome back to the wonders of the M25 motorway, I am so glad I don’t do that commute anymore) and then a major traffic accident on the way to Portsmouth, most likely caused by the heavy rain and winds we had that day. Whilst not what we hoped for, we enjoyed some tea and cakes as we sat in a very long line of traffic when suddenly the road cleared and so did the skies allowing a quick drive through the New Forest and the new Hindhead Tunnels. 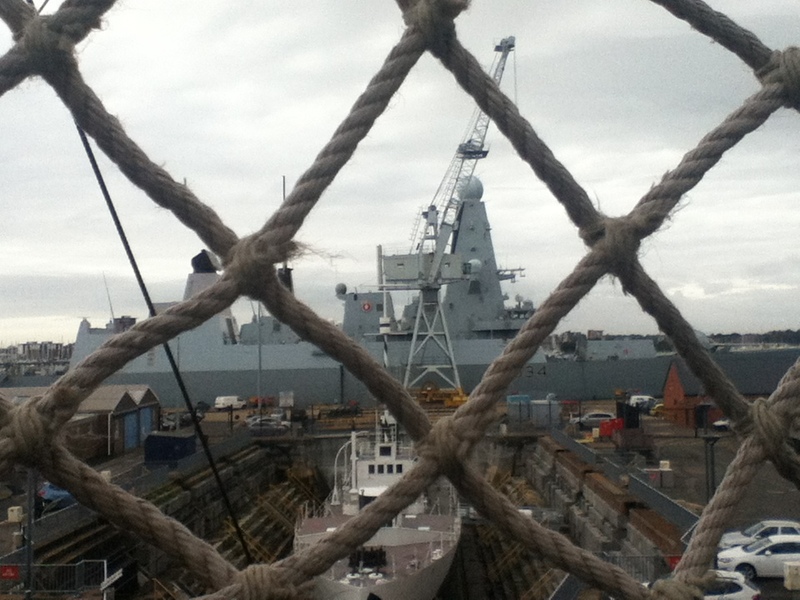 The City of Portsmouth revolves around the port and The Royal Navy. The natural harbour here is one of the largest around and has been used as such since at least Roman times though probably before that. Mary Rose, pride of King Henry VIII. The entrance fee for the Historic Docks is about £26 or $40 per person which sounds quite a lot but I have never heard anyone say it was anything but great value to get in as the tickets gives you access to 3 historic ships, a large museum, an interactive simulator area and a harbour cruise. I first went to Portsmouth as a child on a school trip in 1984 and been back several times and each time is always a great day. We headed over to the Mary Rose Museum. 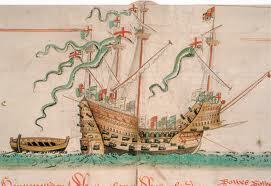 The Mary Rose was the flagship of King Henry VIII, he of the many wives and beheadings to slightly stereotype him. In one of the several attempts by France to invade England, an English fleet was quickly sent out from Portsmouth where it was thought the French would conquer the nearby large island of the Isle of Wight and use it as a base to invade the mainland. Though the battle was a success, sadly for the hundreds of men on board, the Mary Rose sank just a mile out to sea. It is still unknown why she sank so quickly but it was likely due to a lucky early French shot, overloading of supplies and weapons or a number of open gun-ports being left open allowing the sea to flood in sinking the pride of the English Navy is minutes. Comparative illustration of the English fleet moving out to meet the French navy. In 1982 this historic ship was raised from the seabed, the half of the ship buried in the mud of the sea-floor almost entirely preserved. The ship had to be uniquely treated to avoid it disintegrating and for the last 30 years it has been housed in a temporary shelter where it has been sprayed by a mix of water and chemicals allowing it to gradually dry out and strengthen. 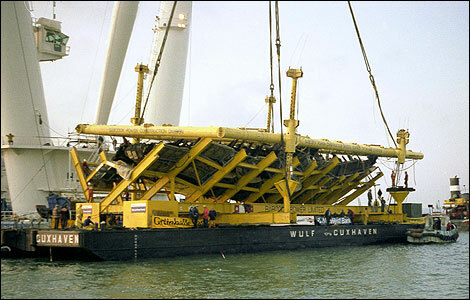 The Mary Rose was lifted from the sea bed on this custom made contraption but the relics were all brought up by hand. Earlier this year, a permanent museum opened which allows visitors to walk alongside the Mary Rose and see it like never before. It’s quite amazing to see it in such good shape having been submerged for nearly 400 years. 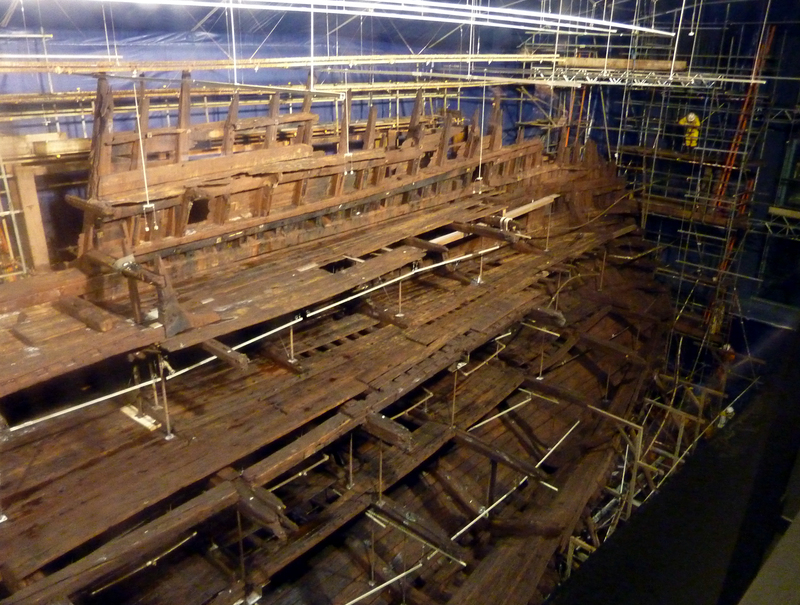 Preservation work on the Mary Rose is scheduled for another 3-4 years. The diving teams have also recovered approximately 20,000 objects from the ship from guns and cannons to personal effects such as combs, pens and even the remains of the ships dog. The men on the Mary Rose mostly ate stews and broths. This giant pot was made from lead, meaning everyone eating from it would eventually be poisoned! 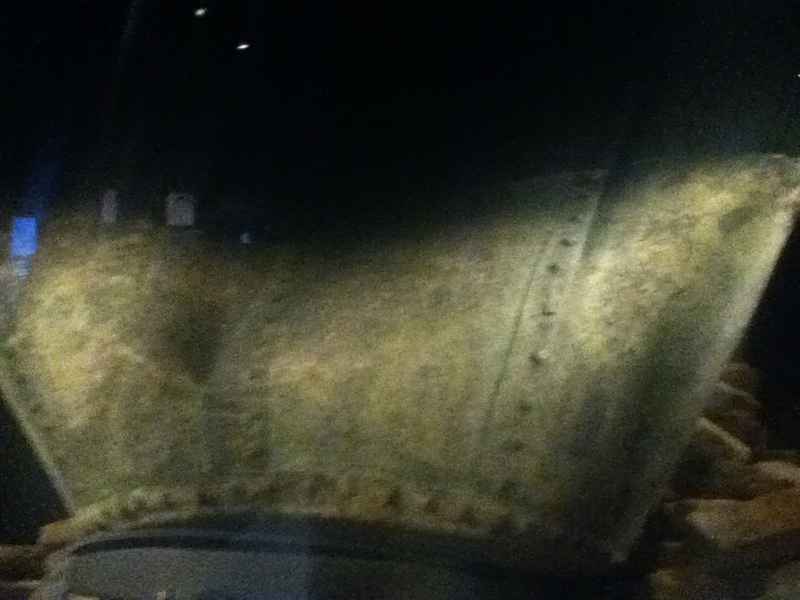 Despite having seen the ship before, this was the best yet and the artefacts are extremely interesting and haunting. One wonders what King Henry would think of it all. Next up is the probably the pride and joy of the whole museum, HMS Victory. HMS Victory was of course the flagship of Lord Horatio Nelson and fought in many battles but is best remembered for The Battle of Trafalgar wherein Nelson led a much smaller force but with much better tactics and seamanship destroyed a combined French and Spanish Fleet. Nelson was a great man, leader and warrior and in his long career lost both an eye and the use of an arm. However he also did much to improve the welfare of his men regarding their food, health and welfare. Previously the conditions had been so horrendous that few volunteered to join the navy and so many were press-ganged which generally involves going to a pub in the city, drinking a little too much and getting clubbed over the head only for the unfortunate victims to wake far from land! It was both his brilliance and care for his men that won him the support of the navy and the country but at 1.30pm towards the end of the Battle of Trafalgar, Lord Nelson was shot by a sniper who was placed high up in the rigging of a French ship. He was mortally wounded and though he lived long enough to know the battle was won, he died below deck at 4.30pm. 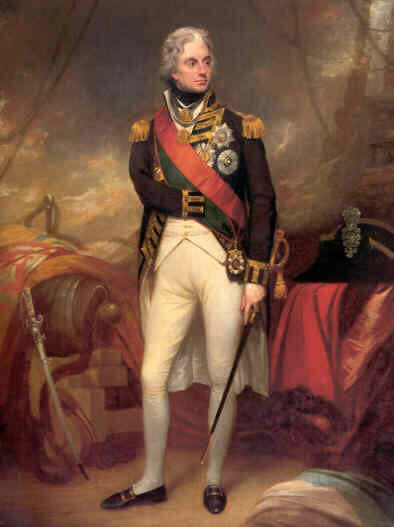 Such was his success at Trafalgar that there was virtual peace at sea for 100 years and Britain never again faced the threat of invasion until 1939. The body of Nelson was preserved and he was given a heroes funeral whilst the Victory continued to sail for another 20 years or so before being retired. 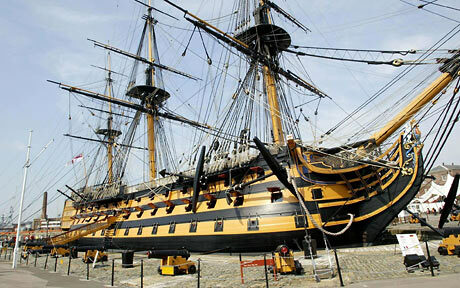 HMS Victory is still a Commissioned Royal Navy ship and is the oldest commissioned warship in the world. It has a real Captain and crew and flies the white ensign as do all active Warships. As it happened, we were visiting HMS Victory on 21st October which is Trafalgar Day and we had just missed out on a ceremony on the upper deck where an Admiral had laid a wreath on the spot where Nelson was shot and in commemoration of all those who died on that day. 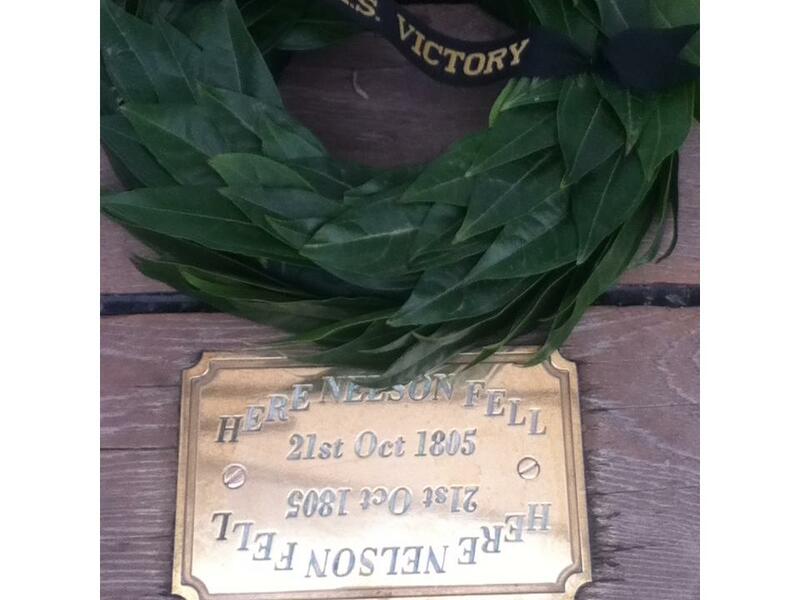 Freshly placed wreath on the plaque marking the spot where Nelson fell. Much of the sails and rigging of the Victory was absent for conservation work which will keep Victory going for another 240 years but there were flags flying out. Before the invention of radio or the use of morse-code, the Royal Navy used flags which could be used to relay orders to all the ships of the fleet. Today the flags gave out the famous orders that Nelson issued before the battle “England expects that every man will do his duty” something which was probably the most famous quote in the country until Churchill at least. From wars to politics to sports teams, England Expects That Every Man Do His Duty is still a very famous phrase. 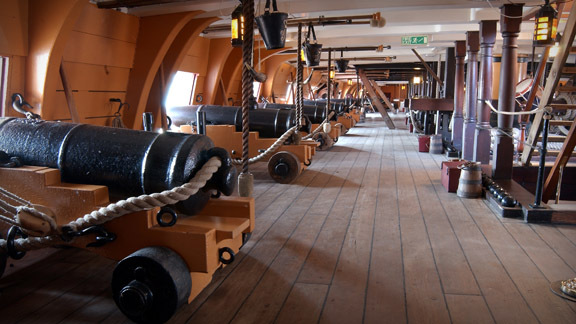 HMS Victory is very solidly built of oak and it has 104 cannons on several decks. There are sleeping areas though men would often eat next to their cannons when there was an impending battle. 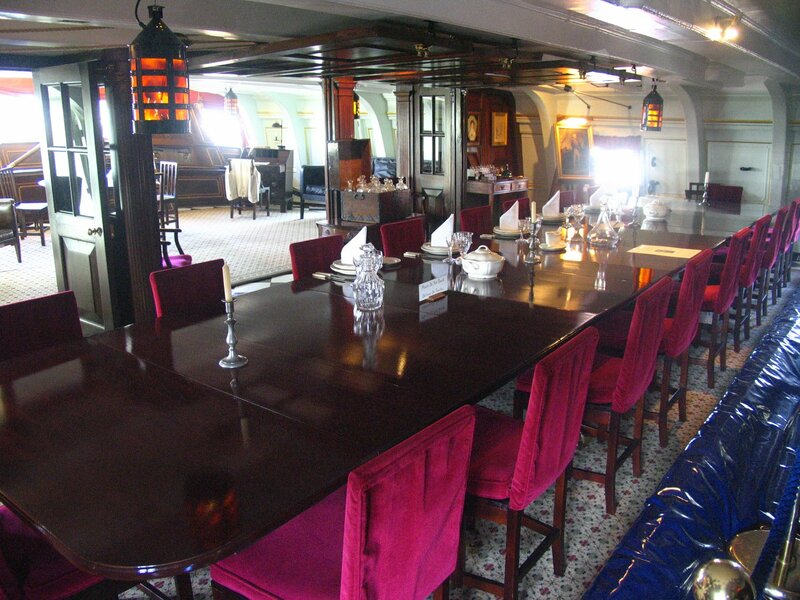 The quarters of Lord Nelson himself are very plush with large windows, fine furniture and the like. Today it was looking different than usual as there was to be an anniversary dinner held that night. HMS Victory held up to 35 tonnes of gunpowder amongst many other things. The gunpowder was held deep in the ship with copper plating on the walls and water vats in the ceiling so that any small fire could be instantly put out by pulling a chord that drenched the room in water. If the gunpowder were to explode, it wouldn’t just destroy the Victory but would devastate everything in a 3 mile radius. Probably the most uneasy part of visiting HMS Victory is going down to the operating theatre where a fearsome display of medical instruments and saws were set out. It is here where you can see the famous painting of the death of Nelson which is on display pretty much where he died. The surgeon on the ship knew a surprising amount of medical knowledge and basic hygiene but I still would fancy having any treatment here. Still, much better than centuries earlier when the effectiveness of some surgeons was judged not on the survival rate of the patients but on the number of amputations he could carry out each hour with each operation just taking a minute or two! 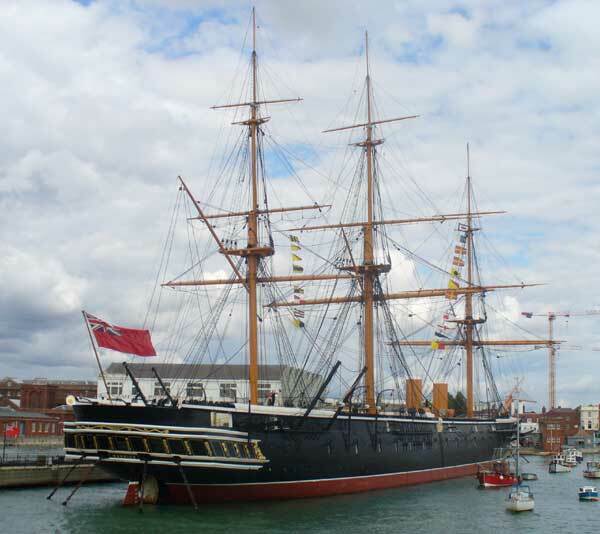 There are several other ships in the historic dockyard, the largest is the 19th Century vessel, HMS Warrior, an ironclad ship which uses both generated energy and old fashioned wind-power. This ship is much bigger than Victory but my guests were happy to give it a miss being rather “shipped out” by the at times steep steps that go between decks. Instead we decided to go on the Harbour Cruise. HMS Warrior, ironclad and the most powerful ship of its era. One of the great things about Portsmouth is that it is still a very active Naval base as well as a shipyard where even now large sections of Aircraft Carriers are being built behind closed doors. Going on the harbour cruise is always fun as you get to see whatever ships of the Royal Navy are in the harbour as well as various ferries, passenger cruises and cargo ships. We saw some Frigates and several Destroyers including one that had just come back from a 39 week anti-piracy mission off the coast of Somalia. 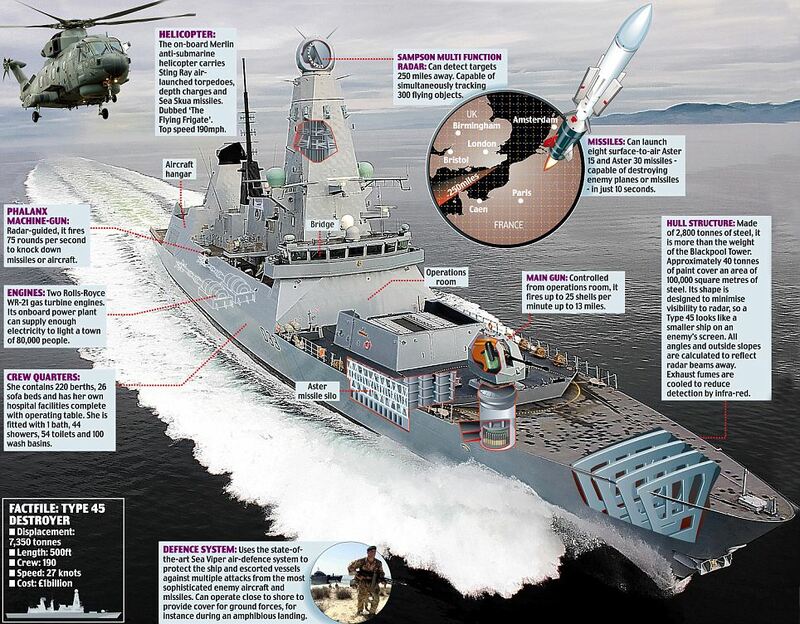 I was very pleased to see some of the new Type 45 Daring Class ships. As you’ll see from the photos below, they look like a Stealth ship and are said to be 5 years more advanced than any other naval vessels. Their new sonar, computer and anti-missile defence systems are said to be able to track and destroy 2,000 incoming threats simultaneously at the size of just a cricket ball. Whilst we were on the cruise, our boat stayed further out from the quayside than usual due to a security incident that we saw ongoing with several police and fire engines with their lights on. In many ways though, we were probably in the safest place on Earth! We also saw some new ships that were being readied for the Omani Navy as well as some old vessels that were looking rather sad and waiting to be sold and re-fitted abroad or simply scrapped. 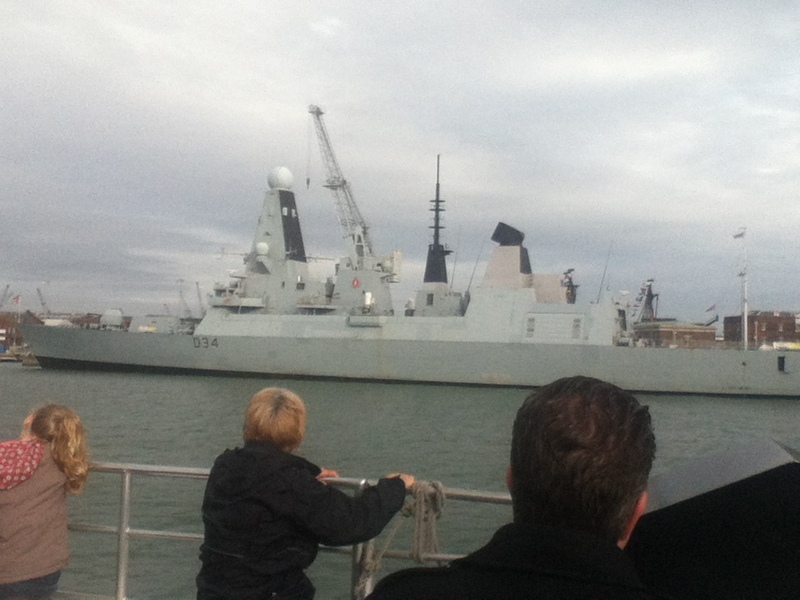 HMS Diamond one of the Daring Class Destroyer at Portsmouth yesterday. The harbour cruise takes about 45 minutes and with the sun coming out and 19C/66F temperatures it was very pleasant out. Finally having visited another museum or two, we headed back towards the car but not before stopping to have some Fish and Chips at the shop opposite the front gates. There was zero traffic heading back to London and John and Anne were back in their hotel in a little over an hour later. They enjoyed it immensely, there isn’t anywhere quite like Portsmouth and they were very happy with me and I was very lucky to have two such nice people as my first official guests. 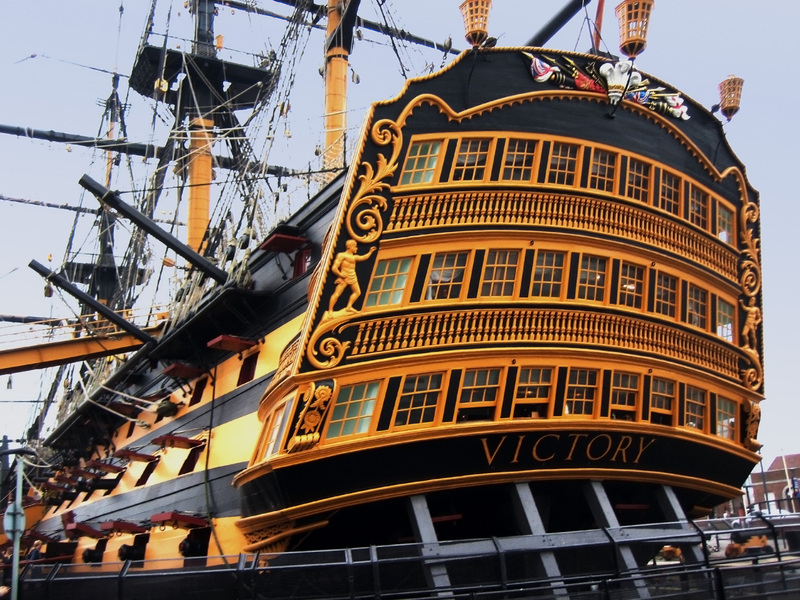 This entry was posted in history, Travel, Ye Olde England Tours and tagged Culture, Daring Class Destroyers, history, HMS Victory, Life, Mary Rose, Nelson, Portsmouth Historic Dockyard, Royal Navy, Ye Olde England Tours. Bookmark the permalink. Lovely post…..I use to play on the Victory as a child, you could go anywhere on it and it didn’t cost a penny. One of my 4 x great grandfathers was a Marine on her. My 3 x great grandfather sailed on Warrior on her maiden voyage…..but can’t find anyone yet who was on the Mary Rose…although I was down at Sally Port when they brought her in. You might guess I am a Portsmouth lass 🙂 I really enjoyed your tour and what a lovely visit for your guests. Thank-you. Wow that must have been amazing to be able to play on he Victory. I bet everyone wanted to be Nelson! Portsmouth is one of my favourite places, I never get much past the docks which is a shame as I know there are castles, D-Day museums and submarines to visit in Gosport too.